Although today is my birthday, thankfully this is not a post about me in my birthday suit. 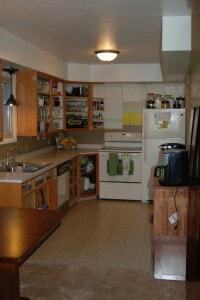 Instead, the kitchen, in it’s naked glory. Yep stripped down and ready for some cabinet painting this is how it currently looks! 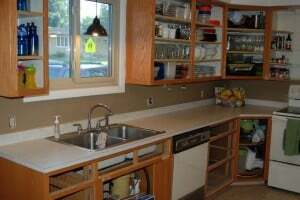 Here is the first before picture. 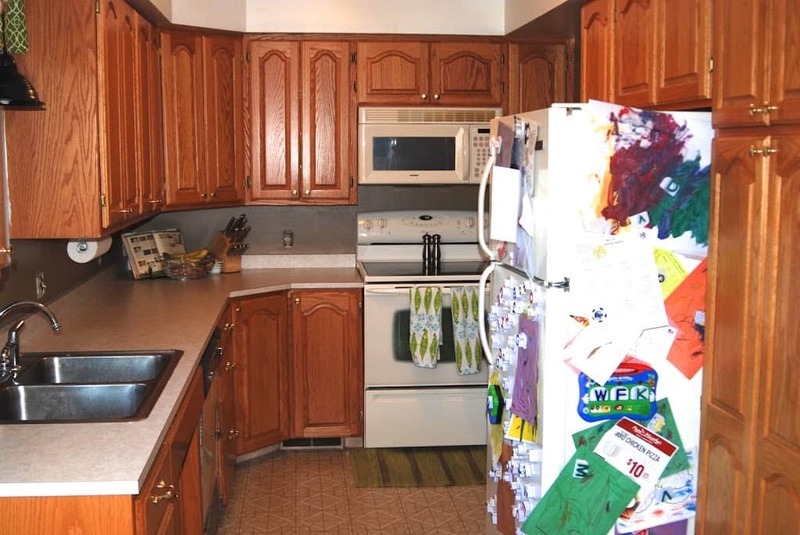 Does it look like the fridge is in the middle of the kitchen? That’s because it is, immediately in the middle of the kitchen. Could I open the fridge and dishwasher at the same time? Nope. 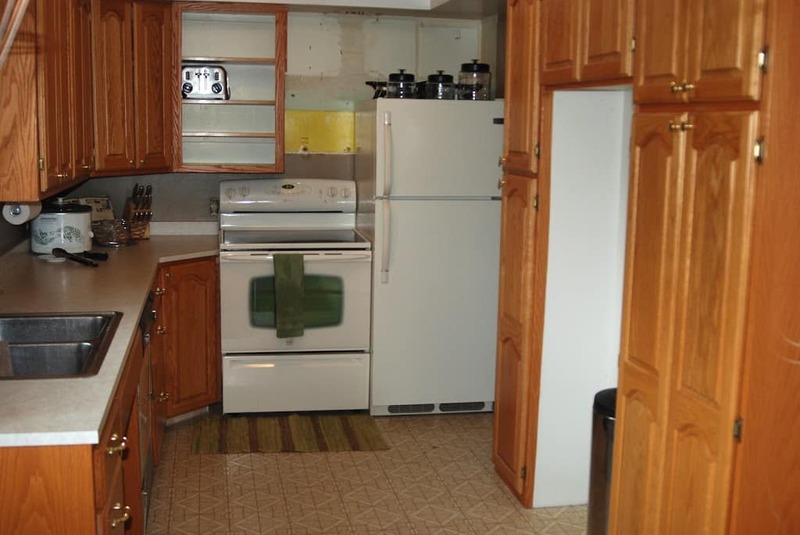 Could someone walk through with the fridge or dishwasher open? Nope. It was a kitchen design disaster. Here are the boys demonstrating for me. The phrase “NO BOYS IN THE KITCHEN” may have been yelled said a few times while I tried to cook. First order of business (three weeks ago) was to remove the microwave (which is now temporarily located in the laundry room). Next came cutting off some countertop next to the oven. Then we removed the cabinet above the microwave, the cabinet next to the microwave, and the bottom cabinets on both sides of the oven. This involved a sawzall, a crowbar, and a few mishaps through the drywall. Let me just say they didn’t come down quite like they do on HGTV. Then we were able to shift the oven to the left and the fridge out of the middle of the kitchen, and into it’s new home. Next step (two weeks ago) involved demoing the cabinets that used to be around the fridge, as well as half of the cabinet above the oven (because really… who wants a cabinet immediately above their burner???). So last night and this morning I spent removing cabinet doors and hardware, and finding places for everything that was in the 6 drawers (That’s where the sanded down buffet comes into effect). Hopefully I will be able to post some painting progress soon! 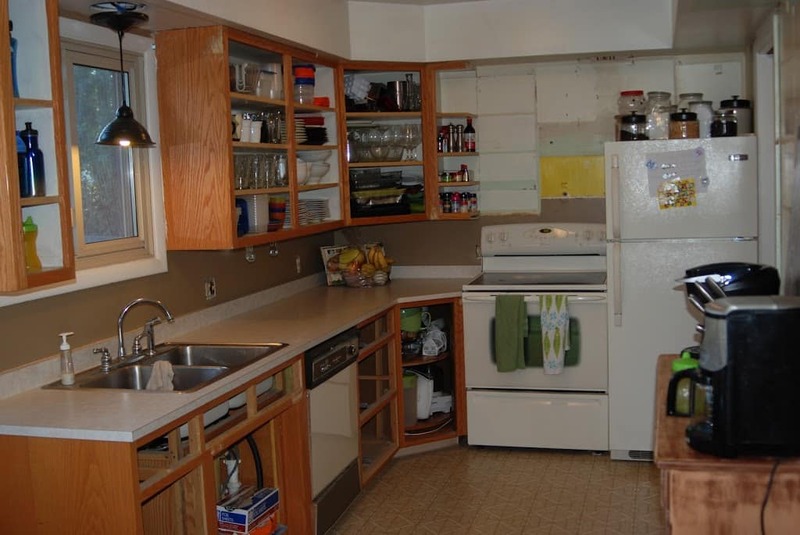 Although it’s hard to see past the overly stuffed doorless cabinets, can you feel how much more open the kitchen is now??? I can actually see more than the fridge when I walk in from the garage. 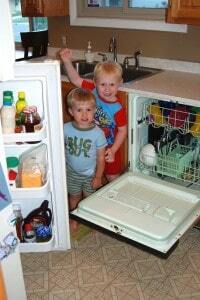 I can now open the dishwasher and fridge at the same time. As Matt says, “It’s now a two booty kitchen!”. It makes me just want to do a little twirl in it! (I may have made my brother in law Bri tell me how amazing it is every time he stepped foot in the kitchen a time or two). « Life in a small town- Life of Doom? Wow you have been busy!